Spoiler alert: This movie is fairly violent, it’s well over two hours long, and everyone has already seen it. New York, June, 1970. We see three men in a car, driving somewhere late at night, and the car is making a knocking sound. The driver asks, “What’s up? Did I hit something?” “Maybe you got a flat.” Not quite. We learn the knocking is coming from a man, thought killed, but still alive and kicking,in the trunk. Time to finish the job. We soon find that this kind of thing is routine for these guys. Part of the fun, even, for at least two of them. 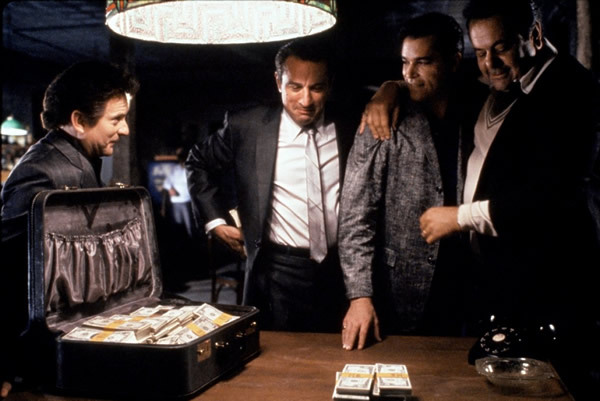 These men are the three main players: Jimmy “Jimmy the Gent” Conway (Robert DeNiro), Tommy DeVito (Joe Pesci), and the film’s anti-hero, Henry Hill (Ray Liotta). We will shortly meet the man who oversees the lot, Paulie Cicero (Paul Sorvino). Flashback to the anti-hero, as a boy, in East New York, 1955. “For as long as I can remember I always wanted to be a gangster… To be a gangster was to own the world.” Voiceover, yes, but it works, as it functions as part of the story, not as an exposition device to do the audience’s work for them. We see the Mob lifestyle and its incredible attraction, starting with the thirteen-year-old Henry Hill’s job, parking the wiseguys’ cars at the cabstand across the street from his house. “Wiseguys would pull up and Tuddy would let me park their Cadillacs… I was part of something… I belonged.” His teen fashion statement, presented at the front door, showing his new suit and shiny shoes to his mother. “What do you think? Aren’t my shoes great?” His horrified mother looks him over, finishing with the shoes, “You look like a gangster.” That’s the point. And it was all done dressed in expensive suits, shirts with exaggerated collars, loud ties, and really shiny shoes. But we soon see that there is not a lot of honor among these thieves. This is not The Godfather. A restaurant that catered to gangsters is taken over by those same gangsters, “busted out,” milked dry, and burned to the ground. We see double-crosses, and hits on those who enabled big scores. There are killings over minor insults. So, why “Witness Protection Program”? After Apalachin, after Vilachi, even the aging FBI chief had to admit that there really was a Mafia. In 1970 Congress passed the Racketeer Influenced and Corrupt Organizations Act (RICO), which included provisions for protecting Mob turncoats by setting them up with new identities far away from the scenes of their crimes. On some level, the powers that be, who had allowed organized crime to flourish, decided that this thing had to come to an end. Too much power. This country is not big enough for both of us. The prosecutions took a decade to really get going, starting in the ’80s, and it’s no accident that this occurred just as the United States was embarking on its love affair with the stock market. Apply RICO to Wall Street? That’s oppressive interference with the free market! And so wiseguy after wiseguy is sent to federal prison for long terms, and the remnants adapt by getting lowkey. No more attracting attention. No more shiny suits and shoes. Gym clothes, even shorts, become the preferred fashion, and it’s not a statement. Scorsese’s choices for the soundtrack are brilliant. He didn’t hire a composer, it’s entirely found music. His only rule was that the song had to comment on the action onscreen “in an oblique way” and must have existed at the time. The music progresses from pleasant, happy, upbeat ’50s schlock to the dark and ironic music of the late Sixties. We first hear Rags to Riches, followed soon by Can’t We Be Sweethearts, backing up the allure of the gangster life to the young Hill. The speed at which the songs come increases as the movie becomes darker. We see Hill dealing coke (and snorting his share) behind his boss’s back to the tune of Gimme Shelter. Sunshine of Your Love plays while Jimmy contemplates a killing. (The look in DeNiro’s eyes in this scene alone is worth the price of admission.) Monkey Man serves as background for paranoid (but well-founded) fear of a helicopter, and the insanity of addiction. We hearLayla while children playing under a highway discover two victims of a hit in their Cadillac, propped up in the front seat for all the world to see, bloody faces on display, blood smeared on the sticker. So why see Goodfellas again? Because this film demands to be seen on the big screen. Goodfellas (1990), directed by Martin Scorsese, screenplay by Martin Scorsese and Nicholas Pileggi, with Robert DeNiro, Joe Pesci, Ray Liotta, Paul Sorvino, and Lorraine Bracco.